National Restaurant Supply is a locally owned and operated family business that delivers exceptional customer service. 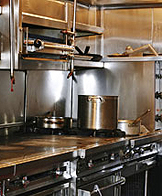 We can sell you a new or used equipment and can also provide complete restaurant construction and restoration supplies. If you provide the building and the permits, there is no job too big or too small for us to handle. We can also buy your business and liquidate all your old equipment for you if you don't want to deal with the hassle. There are financing and leasing options available, so contact us today and get the restaurant kitchen of your dreams today.